I still have a couple of these 22×25 cm / 8.5×9.5″ risograph prints based on the Bacchae by Euripedes left. 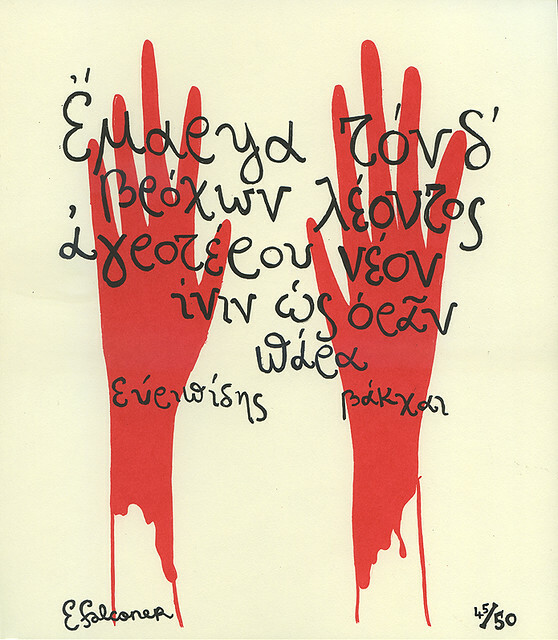 The text says “ἔμαρψα τόνδ᾽ ἄνευ βρόχων λέοντος ἀγροτέρου νέον ἶνιν ὡς ὁρᾶν πάρα.” which means “I caught this young lion by myself, without a trap”. Pentheus’ mother, having run off into the woods with Dionysus to be a maenad, kills her son in a frenzy because she thinks he’s a lion, and then parades his head around the stage boasting about the lion she’s killed. That old plot cliché. Once they’re gone, they’re gone forever. £10 + postage in the shop. If you would like the same design as a canvas print or a mug they are available here.